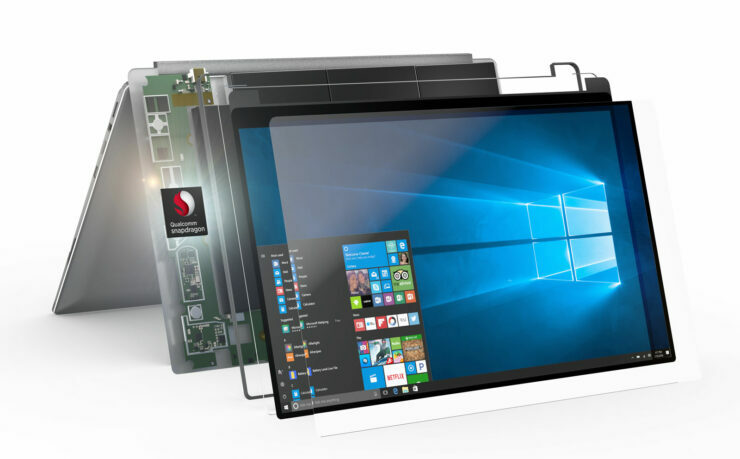 The Snapdragon 1000 is expected to succeed the limitations of the Snapdragon 850 for Windows 10-powered notebooks and 2-in-1’s. Now a brand new leak reveals the hidden performance attributes of the Snapdragon 1000, going as far as to be placed in ‘desktop’ machines. An excerpt from a Qualcomm employee reveals that a Snapdragon premium tier chipset called the SDM1000 will be dedicated for a variety of products, including desktop computers, Microsoft’s upcoming Andromeda device, and the next-generation HoloLens. What is interesting to note here is that this excerpt reveals the term ‘desktop’, which we’re not trying to confuse readers, but desktop computers feature actual socketed processors running in large chassis. It is possible that the Snapdragon 1000 will originally take on Intel’s U-series of processors, which have a 15-watt TDP as we reported earlier. The Snapdragon 1000 is expected to feature a 12-watt TDP which potentially means higher clock speeds for the cores running in the chipset. Our previously reported information also spoke about the impressive hardware specifications that you can read below. Qualcomm’s Snapdragon 850 is already competing with Intel’s Y-series of chips with a max. TDP of 6.5 watts. With a TDP of 12W and dimensions of 20 x 15mm, the Snapdragon 1000 is already large by ARM standards. In comparison, the upcoming Snapdragon 855 is said to feature a package size of 12.4 x 12.4mm, making it comparatively smaller than the upcoming SDM1000. However, it is important to note that the original name of the Snapdragon 1000 might be changed to something else. Additionally, the SoC will provide support for up to 16GB of LPDDR4X RAM and 256GB of UFS 2.1 storage. In the future, we will eventually see chipsets gain support for LPDDR5 RAM and UFS 3.0 storage but for the moment, this standard is going to remain. Qualcomm is not the only manufacturer aiming to bring high-performance chipsets to fuel machines of the future. It is possible that the Huawei Kirin 1020 is also designed for the same purpose, and is said to deliver twice the performance of the Kirin 970. The Snapdragon 1000 could potentially take mobile SoCs to a whole new echelon of performance and battery endurance and we’ll keep you up to date with the latest information so stay tuned.